Follow us on Pinterest and send a quick note so we can complete your setup. This is a temporary rule until we get API approvals from Pinterest within the next few weeks. Once you hear back from us, you will be able to proceed with connecting Pinterest and adding Pinterest boards. As with Instagram and Facebook, visit the Manage Accounts page and scroll to the bottom. Click the blue Add Pinterest Board button. 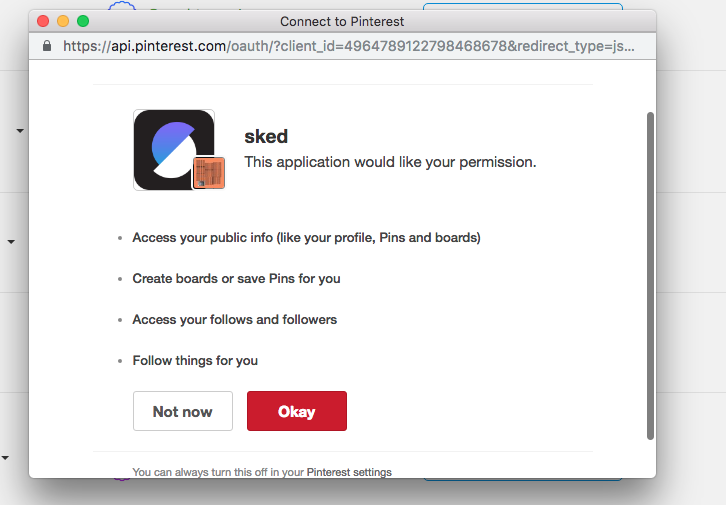 Pinterest will prompt you in a popup for permission for Sked Social to access your account. Click the red Okay button. This should allow you to select and connect your Pinterest boards to your Sked Social. If you are having problems, you can book a one-on-one with our team and we're happy to assist.